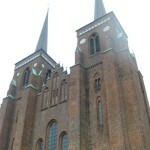 Roskilde Domkirke (Roskilde Cathedral) in the city of Roskilde on the island of Zealand (Sjælland) in eastern Denmark, is a cathedral of the Lutheran Church of Denmark. 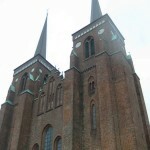 The first Gothic cathedral to be built of brick, it encouraged the spread of the Brick Gothic style throughout Northern Europe. 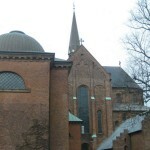 Constructed during the 12th and 13th centuries, the cathedral incorporates both Gothic and Romanesque architectural features in its design. 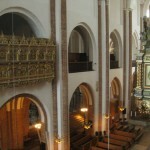 Until the 20th century, it was Zealand’s only cathedral. Its twin spires dominate the skyline of the town. 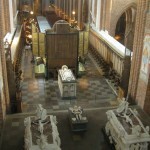 The cathedral has been the main burial site for Danish monarchs since the 15th century. 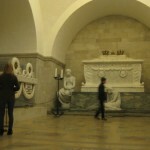 As such, it has been significantly extended and altered over the centuries to accommodate a considerable number of burial chapels. 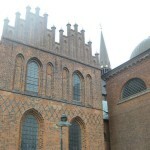 Following the Danish Reformation in 1536, the bishop’s residence was moved to Copenhagen while the title was changed to Bishop of Zealand. 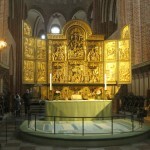 Coronations normally took place in Copenhagen’s Church of Our Lady or in the chapel of Frederiksborg Palace. 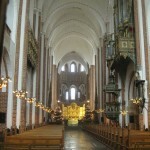 The cathedral is a major tourist attraction, bringing in over 125,000 visitors annually. 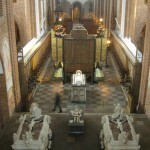 Since 1995, it has been listed as a UNESCO World Heritage Site. 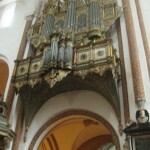 A working church, it also hosts concerts throughout the year.